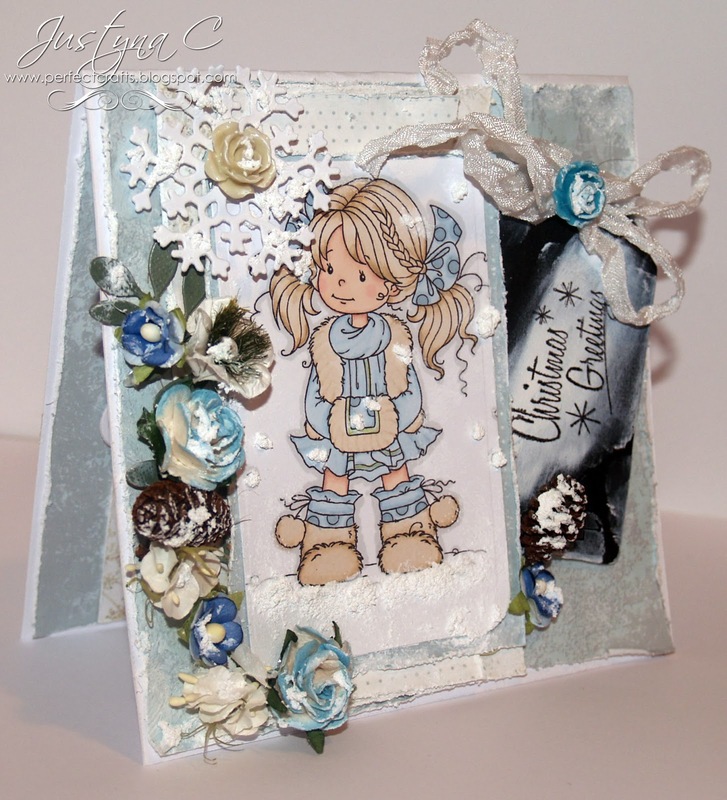 Today I’m showing you my winter card. Love this digi. You can by it Here. Papers from First Edition Paper “Silent Night”, sentiment “Vintage Christmas Stamps” – I stamped onto wooden Christmas tag from HobbyCraft. Flowers, birch pine cones, white “Handmade” Shabby seam binding from Live & Love Crafts – my FAVOURITE shop! I added Snow-Tex by DecoArt to create dimensional effects. Card measures approx 6″ x 6″. The inside has been decorated to compliment the front of the card. Oh wow this is so beautiful. Love the shabby chic feel. I saw this on MIM and just had to pop over to have a closer look. Justyna, this is stunning!! Your colouring on the digi is beautiful. I totally love your colour scheme and the flowers and snowflakes are gorgeous. Thanks for playing along with us this week at OSAAT, hope to see you back again soon. I distressed all edges using Distress it All by Zutter. I painted black wooden tag with white acrylic paint and stamped sentiment onto it.